So when you work for yourself, instead of a structure that tells you when to work, you have to find your rythm. The times of the day when you get certain stuff done. For me, after a coffee in the morning, I have a few hours of very creative, focused attention in which I get a lot done. Rythm has a lot to do with how you eat, by the way. But it’s different for everyone. So, finding your rythm. Figuring out when’s a good time to do coding, versus when’s a good time to go to the bank. “Curfew in Baghdad normally starts at 8 pm most days. This means no cars are allowed on the streets after 8pm, and you shouldn’t be wandering outside your house without extremely urgent business. These days Iraqis tend to be at home by 5 or 6pm. Before the war, even during the sanctions, Mansur was a hip, lively, exciting area. Think of it as the East Village or Mission District of Baghdad. Now the curfew begins at 11am on Fridays, and doesn’t end until 6am Saturday. 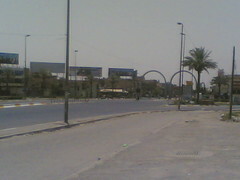 This means Iraqis are prevented from travelling the city for almost 24 hours one day a week. "Minuteman Fuera de NYC!!! ": the "Minutemen" are this self-appointed group of people who want to get immigrants out of the country. What a crazy idea, and racist too. This is a video of a protest against the minutemen. I’m up early today, couldn’t sleep with the heat. It’s 4:00 am. Yeah, that’s ridiculous. So I figured I’d do an experiment. Since I work mostly from home these days, I’m always trying to find the best rythm. I know that usually, I get up and from like 8:00am to noon, I’m very productive. In the afternoon, not so, so I do chores then. What can I get done this early? Is it a time to code? To wax philosophically? To read up? "Prodigio peruano en Nueva York". I met Gerardo a few weeks ago. He’s videoblogging for El Diario, a Spanish newspaper in New York. His videoblogs are fantastic, a great insight in daily life of Spanish New York. He’s a pioneer. He must be one of the first paid videobloggers in the world.